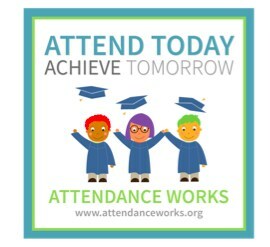 Good attendance helps children do well in school and eventually in the workplace. Attendance matters for school success, starting as early as pre kindergarten, throughout elementary school and beyond. Developing the habit of attendance prepares students for success on the job and in life. School attendance is the strongest predictor of High School Graduation. Don’t let your child miss school without a valid reason. Avoid medical appointments during the school day or vacations when school is in session. Maintain a positive attitude about school and attendance. Children are taught the value of education by the adults in their lives! Create routines and stick to them! Make sure your child goes to bed early, prepare school clothes and supplies the night before and have them ready for school the next day. Contact your school principal if your child is having problems attending school regularly. HELP YOUR CHILD BE SUCCESSFUL BY BEING IN SCHOOL EVERY DAY AND ON TIME! California Education Code 48200: students between the ages of 6 and 18 years are required to attend school full time, unless otherwise exempt. California Education Code 48260: any student who is absent without a valid excuse 3 full days in one school ear or tardy for more than a 30-minute period without a valid excuse or a combination of both is considered a Truant. California Education Code 48263: habitually truant students may be referred to SARB -School Attendance Review Board-. California Education Code 48293: failure to comply with SARB is an infraction and the parent may be fined up to $500. California Penal Code 270.1: if parents allow their children in the K-8th grade to miss 10% or more of the school year; they can be prosecuted for a misdemeanor with up to one year in jail and $2,000 in fines. The mission of the Attendance Review Board -SARB- is to help students stay in school, attend school regularly and graduate. SARB is a community-based effort to bring together resources to assist families with attendance, truancy and behavior issues. California compulsory education law requires everyone between the ages of six and eighteen years of age to attend school. In 1974, the Legislature enacted California Education Code (EC) Section 48320 to enhance the enforcement of compulsory education laws and to divert students with school attendance or behavior problems from the juvenile justice system until all available resources have been exhausted. Although the goal of SARBs is to keep students in school and provide them with a meaningful educational experience, SARBs do have the power, when necessary, to refer students and their parents or legal guardians to court. What does SARB do for students? *Parents/guardians should contact the school to verify a student’s absence during the first day of the absence from school or class. Absences that are not verified within five (5) school days following the student’s return to school should be classified as unexcused. Did you know about Partial Day Absence including Tardy & Early Removal from School? Compulsory attendance law and policy require school districts to record every tardy of less than 30 minutes or more than 30 minutes and any early removal from school, including, but not limited to, those regarding personal medical, dental, optometric, or chiropractic appointments. This record is listed in the attendance log for the student. If a student leaves early, his/her attendance log will be coded appropriately indicating whether it was excused or unexcused. This is also true regarding tardiness to school. Habitual tardiness or early removal from school that is unexcused may result in interventions by the school site or District Office to improve this behavior. *Remember that students can make up an absence by attending Saturday School, please check the Saturday School calendar at your school site! Our school sites offer a whole range of exciting activities for Saturday School!